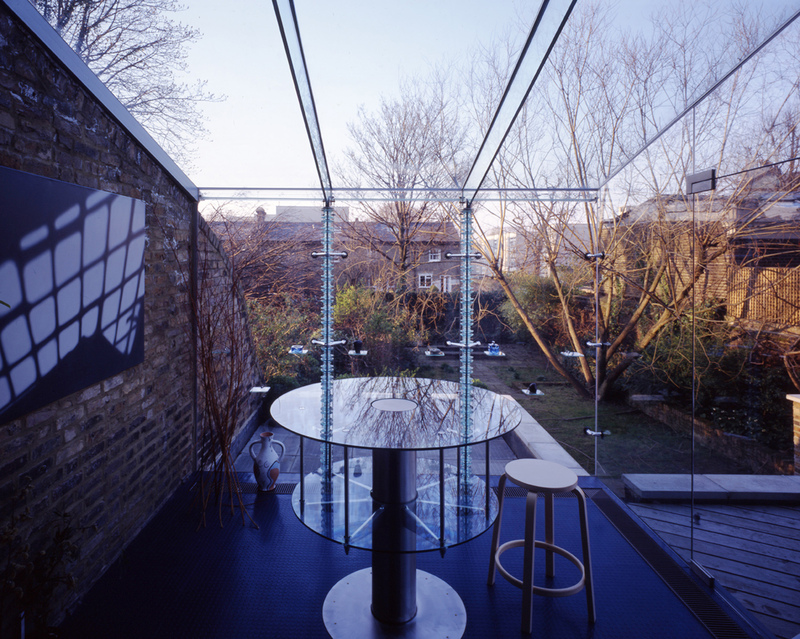 Our project for a new glass addition to the back of a Grade 2 Listed house in South London stimulated debate in the late 1990’s about decoration in architecture, a theme that several other architectural practices went on to famously exploit in their work for the next 20 years. This project established bere:architects as a team of creative, inventive designers, and a leading innovator in the use of structural glass. The project centred upon the invention of a post-tensioned, stacked-glass structural column system, with integral 12volt lighting rods and bespoke lights, that supports the glass walls and glass beams of a new conservatory. The scheme demonstrated how modern architectural solutions can be compatible with the rigorous requirements of English Heritage for work on a Listed Building, and English Heritage went on to formally acknowledge that Listed Buildings could be extended by contemporary transparent glass structures. We were subsequently invited to develop the concept for a challenging commercial application in the flagship London Wall Pizza Express project.